Critical to your independence and quality of life, your legs, ankles, and feet are some of the most abused thanks to New Yorkers “walking city” reality. Our therapists can help get you back on your feet and feeling great. From standing in line at your favorite coffee shop to running the NYC Marathon, good foot mechanics can be a challenge in a city like New York. Your feet never get a break (face it, you never land a seat on the subway during rush hour)! ​As a moving foundation for the body, the foot’s ability to bear weight correctly is indispensable for a healthy muscular balance of your whole leg. When treating conditions of the foot and ankle, our therapists look at the whole leg to ensure proper loading for efficient gait. Our therapy is customized to your need and is focused on addressing the root of your problem. No two individuals are alike, and we treat their injuries and conditions with the same mentality. Some conditions we treat are discussed on this page, but this list is far from complete. If you do not see your specific problem, please feel free to get in touch with us. Leg, foot, and ankle pain can happen to anyone, especially if you spend considerable time walking around the city. We work with people from all creeds and lifestyles, and have specific expertise with auto accident injuries, sports injuries, and repetitive stress injuries. Keep scrolling to see a more detailed breakdown! The first step with any treatment – especially when involving the lower body – is to assess the injury or condition causing pain. We are less interested in addressing symptoms (though that is very much a goal), and are instead focused on identifying and treating the root of the problem. Arthritis in lower extremity injuries can be painful and difficult for patients, especially in NYC where they are constantly on their feet. When we’re starting treatment with arthritis in the leg, foot and ankle it’s important to first control symptoms and set goals to work towards in the rehab process. We will work to lower the pain and increase the flexibility of the joints through controlled exercises and different manual therapy techniques. Dealing with bursitis is difficult for New Yorkers on the go. We work to reduce swelling, and improve range of motion of the area to prevent further irritation and inflammation. 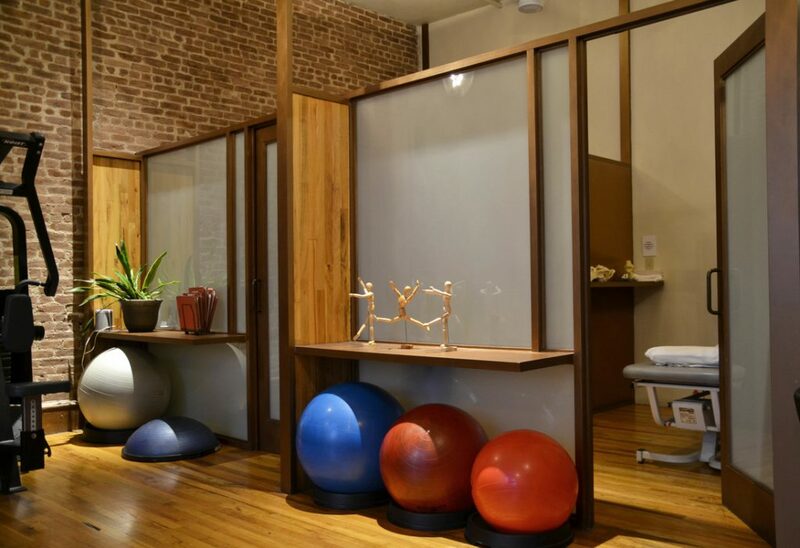 Our team of therapists and trainers will work to relieve stiffness, and improve muscular deficiencies and pain. A thorough evaluation of the injury helps our therapists create an exercise program for the patient’s case to improve balance, biomechanics, proper loading of the joints affected to help alleviate pain. Dislocations are caused as a result of excessive range of motion and lack of stability and strength revolving the joint. At JFPT our team of therapists and trainers work on building a custom plan of care to return the patient safely to normal activity and pain free movement. Fractures and traumatic injuries are often very difficult injuries and require the patient to work hard to meet physical therapy goals. We treat post operative fractures as singular injuries and develop the patient’s treatment plan according to the protocols set by the orthopedist surgeon. There are many factors to consider when treating gait disorders. Typically, there is an underlying condition prompting gait disorder such as: neuro, vestibular or muscular imbalances. We design a comprehensive treatment plan that emphasizes muscular and vestibular re-education to ensure proper biomechanics during gate. Ligament tears often require surgery and a strict physical therapy regiment after the procedure. At James Fowler PT we follow the surgeon’s post-op protocols closely and work as a team with the orthopedist to meet the surgeon’s and the patient’s goals through range of motion and strength programs. There are different levels of muscle strains and tears, and while they all have similar rehabilitative goals, at JFPT we take a holistic approach to ach individual injury. Our team of therapists conduct a comprehensive evaluation of the patient’s injury history, biomechanics and lifestyle to create specific changes to the patient’s neuromuscular behaviors. Each patient is prescribed an exercise program facilitated through our trainers to ensure proper muscular re-education for the patient to have an effective recovery. Myofascial pain syndrome, also known as muscle soreness or tightness has different levels of pain. When treating muscle soreness in the leg, ankle and foot we focus on first controlling symptoms with different manual therapy techniques. Along the the manual therapy, certain modalities can be used to help relieve pain and swelling to encourage healing. In addition, we will recommend a strengthening program to help counter future myofascial pain. When treating nerve entrapment we often factor full biomechanics to ensure we get to the root of the problem. Flexibility and strength of the muscles affected are an important part of the treatment to reduce pressure to the nerve causing pain and to prevent future episodes. A combination of manual therapies and muscular re-education for strength training helps improve healthy muscles to maintain a pain free lifestyle. With Post surgical reconstruction on lower extremity injuries it’s important to follow the orthopedics surgeon’s protocol and educate the patient on movement rehabilitation. Our team of therapists will design an exercise plan and together with our trainers work on the range of motion, stability and proper loading on the joints. Manual therapies are incorporated as needed to control scar tissue and maintain healthy muscles. Treating repetitive strain injuries in the lower extremities is a challenge in the city that never sleeps. While it is important to rest, at James Fowler PT we encourage healing of the area through different manual therapies, modalities and a customized training program. Proper understanding of biomechanics and muscular imbalances helps the patient stay pain free and prevent further irritation to the injury. Sports technique rehabilitation for a lower extremity injuries is the last step in the recovery process for an athlete. We work to improve strength, range of motion, balance and endurance so the athlete can re-enter their sport stronger and more aware of their mechanics in relationship to their sport. Our team of therapists and trainers works one on one with each athetly to achieve their goals. Tendinitis in the lower extremities is usually caused by poor mechanics and overuse of the area affected. It is important to rest and avoid any and all painful activities to reduce swelling of the area. After a thorough evaluation, our team of therapists will work on controlling swelling to allow the tendon to heal. From there a comprehensive exercise program along with postural reeducation will be prescribed to help tendons return to health and remain pain free.